Today is the day that I bring you this delicious, (mostly) healthy, Twisted Tropical Blender that will both transport you to a white sand beach and make you feel like you’re partying in The French Quarter at the same time. 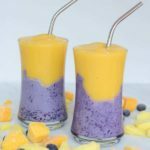 We’ve got a multi-layer, brightly hued, refreshing beverage that is a party in your mouth yet isn’t overly sugary/artificially sweetened like our favorite classic Tiki drinks (i.e. Lava Flows, Pina Coladas, Blue Hawaii’s, etc. etc. ) Twisted Tropical Blenders come with great taste and leave you with a happy waist! You see what I did there? But do you know what else today is? You guessed it: April Fools! I’m pulling a fast one on ya and for the first time ever I’m posting a more-than-delicious beverage, on a Friday, that doesn’t. even. contain. alcohol. That’s right folks. So, needless to say, we’ve been experimenting in the tasty non-alcoholic beverage department a little more than usual lately. You already know that we’re a big fan of smoothies in our household (can’t turn down a Power Protein Smoothie or a Date “Shake”!) so with this Twisted Tropical Blender I aimed for a middle-ground between nutritious smoothie and festive Tiki drink. And what says “festive Tiki drink” more than a couple of brightly hued, fruity layers poured into a glass that clearly shows them off? Okay, let me get down to the nitty gritty. 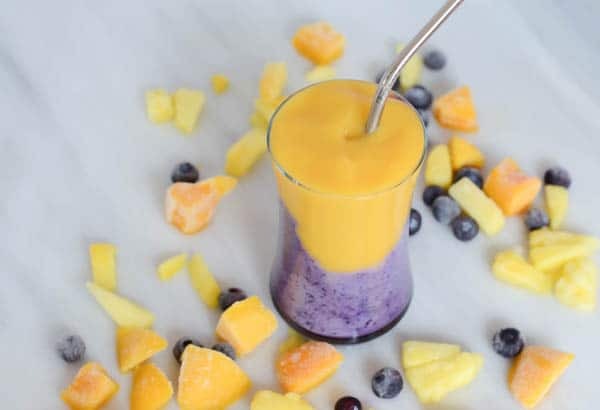 As much as this Twisted Tropical Blender looks like it MUST have some sort of artificial dye to give it this coloring, let me assure you that it absolutely does not. Yes, that’s right. These bright colors all come directly from the fruits themselves. Fancy that! The bottom layer is where we indulge just a teensy tiny bit (see mention of balance two paragraphs up ⇑⇑.) We combine vanilla ice cream (although I totally wouldn’t be opposed to the use of frozen yogurt), frozen blueberries and almond milk and voila! We have a tasty blue concoction that would make even the Smurfs jealous. 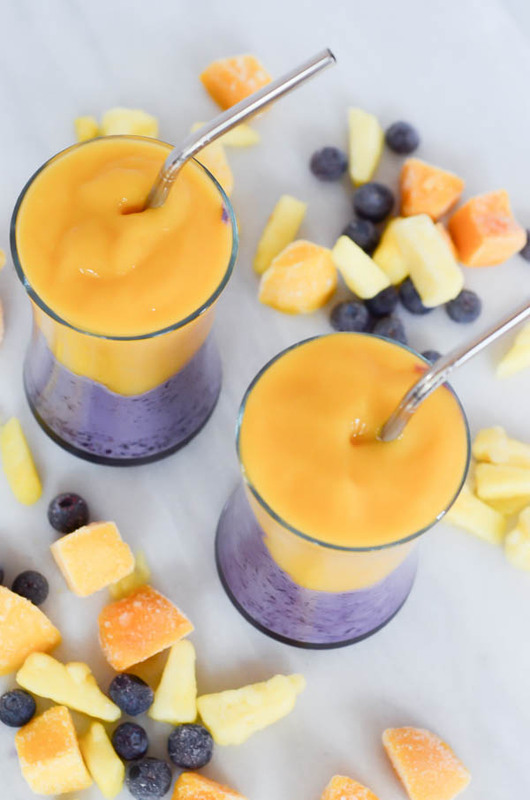 Next up, we combine frozen mango, pineapple juice and more almond milk to provide the more frosty and less creamy top layer. 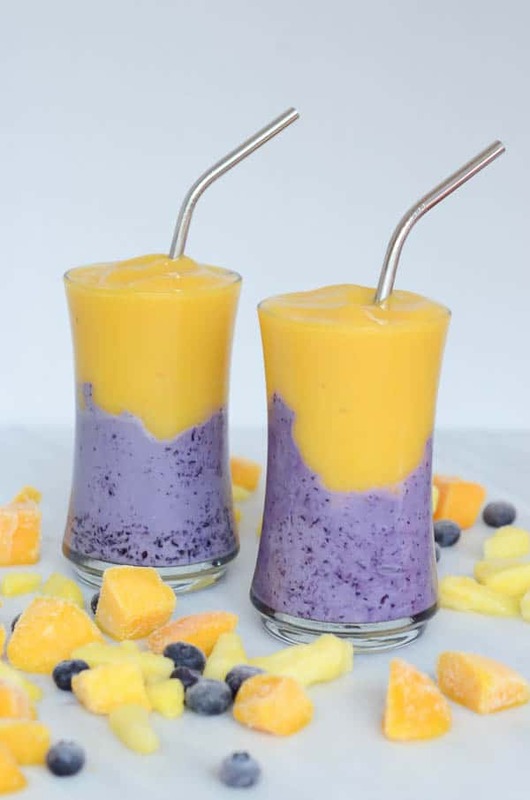 Because the bottom layer has a bit more density to it due to the ice cream, the mango-pineapple layer floats nicely on top without too much blending going on….Picture perfect! What do you think? Are you ready to try this out on a FRIDAY night? If you can’t give up your Happy Hour just yet, this is also perfectly acceptable for breakfast. What are some of your favorite non-alcoholic beverage options? Got any good virgin cocktail recipes to share with me? Hope everyone has a fabulous, healthy, fun-filled weekend! 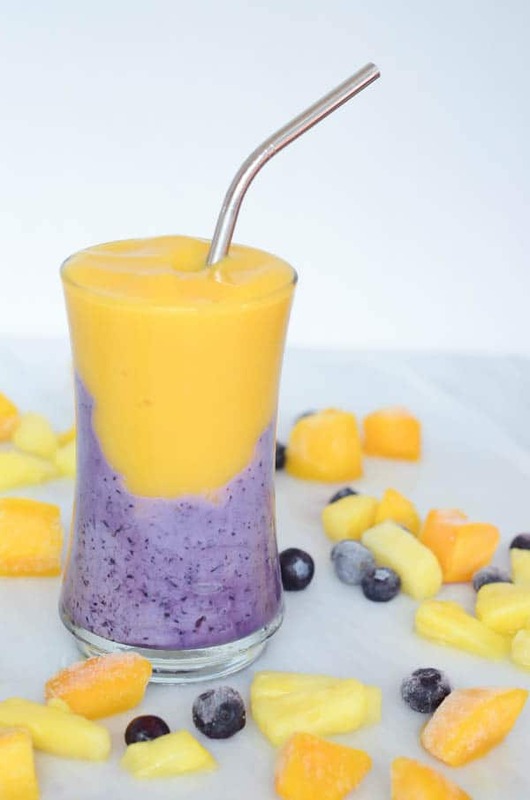 A fun, healthy and refreshing blended drink with vitamin-loaded blueberry, mango and pineapple. Combine all ingredients for the blueberry layer in a high-powered blender. Puree until ingredients are of smoothie consistency. Pour into a glass. 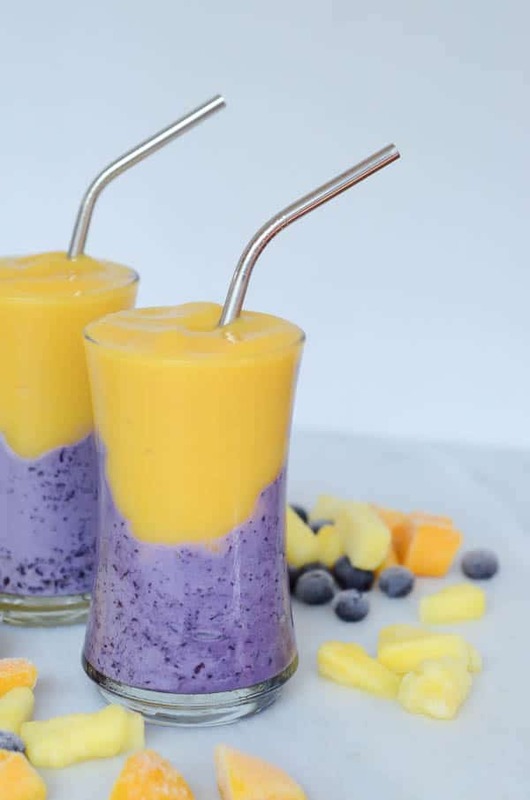 Rinse out the blender and then add all ingredients for the mango-pineapple layer. Puree once again until all ingredients are of smoothie consistency. Gently pour on top of blueberry layer in glass. It’s Friday and it’s Tiki time!